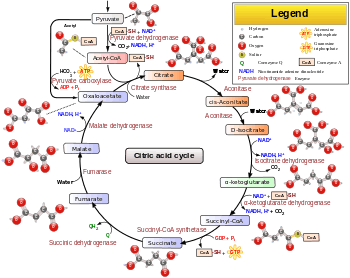 The citric acid cycle – also known as the tricarboxylic acid (TCA) cycle or the Krebs cycle – is a series of chemical reactions used by all aerobic organisms to generate energy through the oxidation of acetyl-CoA derived from carbohydrates, fats and proteins into carbon dioxide and chemical energy in the form of adenosine triphosphate. In addition, the cycle provides precursors of certain amino acids as well as the reducing agent NADH that is used in numerous other biochemical reactions. Its central importance to many biochemical pathways suggests that it was one of the earliest established components of cellular metabolism and may have originated abiogenically. In eukaryotic cells, the citric acid cycle occurs in the matrix of the mitochondrion. In prokaryotic cells, such as bacteria which lack mitochondria, the TCA reaction sequence is performed in the cytosol with the proton gradient for ATP production being across the cell's surface (plasma membrane) rather than the inner membrane of the mitochondrion. Several of the components and reactions of the citric acid cycle were established in the 1930s by the research of the Nobel laureate Albert Szent-Györgyi, for which he received the Nobel Prize in 1937, specifically for his discoveries pertaining to fumaric acid, a key component of the cycle. The citric acid cycle itself was finally identified in 1937 by Hans Adolf Krebs while at the University of Sheffield, for which he received the Nobel Prize for Physiology or Medicine in 1953. Components of the TCA cycle were derived from anaerobic bacteria, and the TCA cycle itself may have evolved more than once. Theoretically there are several alternatives to the TCA cycle; however, the TCA cycle appears to be the most efficient. If several TCA alternatives had evolved independently, they all appear to have converged to the TCA cycle. Structural diagram of acetyl-CoA. The portion in blue, on the left, is the acetyl group; the portion in black is coenzyme A. The citric acid cycle is a key metabolic pathway that unifies carbohydrate, fat, and protein metabolism. The reactions of the cycle are carried out by 8 enzymes that completely oxidize acetate, in the form of acetyl-CoA, into two molecules each of carbon dioxide and water. Through catabolism of sugars, fats, and proteins, a two-carbon organic product acetate in the form of acetyl-CoA is produced which enters the citric acid cycle. The reactions of the cycle also convert three equivalents of nicotinamide adenine dinucleotide (NAD+) into three equivalents of reduced NAD+ (NADH), one equivalent of flavin adenine dinucleotide (FAD) into one equivalent of FADH2, and one equivalent each of guanosine diphosphate (GDP) and inorganic phosphate (Pi) into one equivalent of guanosine triphosphate (GTP). The NADH and FADH2 generated by the citric acid cycle are in turn used by the oxidative phosphorylation pathway to generate energy-rich adenosine triphosphate (ATP). The citric acid cycle begins with the transfer of a two-carbon acetyl group from acetyl-CoA to the four-carbon acceptor compound (oxaloacetate) to form a six-carbon compound (citrate). The citrate then goes through a series of chemical transformations, losing two carboxyl groups as CO2. The carbons lost as CO2 originate from what was oxaloacetate, not directly from acetyl-CoA. The carbons donated by acetyl-CoA become part of the oxaloacetate carbon backbone after the first turn of the citric acid cycle. Loss of the acetyl-CoA-donated carbons as CO2 requires several turns of the citric acid cycle. However, because of the role of the citric acid cycle in anabolism, they might not be lost, since many TCA cycle intermediates are also used as precursors for the biosynthesis of other molecules. Most of the energy made available by the oxidative steps of the cycle is transferred as energy-rich electrons to NAD+, forming NADH. For each acetyl group that enters the citric acid cycle, three molecules of NADH are produced. Electrons are also transferred to the electron acceptor Q, forming QH2. At the end of each cycle, the four-carbon oxaloacetate has been regenerated, and the cycle continues. Two carbon atoms are oxidized to CO2, the energy from these reactions being transferred to other metabolic processes by GTP (or ATP), and as electrons in NADH and QH2. The NADH generated in the TCA cycle may later donate its electrons [oxidative phosphorylation] to drive ATP synthesis; FADH2 is covalently attached to succinate dehydrogenase, an enzyme functioning both in the TCA cycle and the mitochondrial electron transport chain in oxidative phosphorylation. FADH2, therefore, facilitates transfer of electrons to coenzyme Q, which is the final electron acceptor of the reaction catalyzed by the Succinate:ubiquinone oxidoreductase complex, also acting as an intermediate in the electron transport chain. The citric acid cycle is continuously supplied with new carbon in the form of acetyl-CoA, entering at step 0 below. Condensation reaction of GDP + Pi and hydrolysis of Succinyl-CoA involve the H2O needed for balanced equation. Mitochondria in animals, including humans, possess two succinyl-CoA synthetases: one that produces GTP from GDP, and another that produces ATP from ADP. Plants have the type that produces ATP (ADP-forming succinyl-CoA synthetase). Several of the enzymes in the cycle may be loosely associated in a multienzyme protein complex within the mitochondrial matrix. The GTP that is formed by GDP-forming succinyl-CoA synthetase may be utilized by nucleoside-diphosphate kinase to form ATP (the catalyzed reaction is GTP + ADP → GDP + ATP). The above reactions are balanced if Pi represents the H2PO4− ion, ADP and GDP the ADP2− and GDP2− ions, respectively, and ATP and GTP the ATP3− and GTP3− ions, respectively. The total number of ATP obtained after complete oxidation of one glucose in glycolysis, citric acid cycle, and oxidative phosphorylation is estimated to be between 30 and 38. The theoretical maximum yield of ATP through oxidation of one molecule of glucose in glycolysis, citric acid cycle, and oxidative phosphorylation is 38 (assuming 3 molar equivalents of ATP per equivalent NADH and 2 ATP per FADH2). In eukaryotes, two equivalents of NADH are generated in glycolysis, which takes place in the cytoplasm. Transport of these two equivalents into the mitochondria consumes two equivalents of ATP, thus reducing the net production of ATP to 36. Furthermore, inefficiencies in oxidative phosphorylation due to leakage of protons across the mitochondrial membrane and slippage of the ATP synthase/proton pump commonly reduces the ATP yield from NADH and FADH2 to less than the theoretical maximum yield. The observed yields are, therefore, closer to ~2.5 ATP per NADH and ~1.5 ATP per FADH2, further reducing the total net production of ATP to approximately 30. An assessment of the total ATP yield with newly revised proton-to-ATP ratios provides an estimate of 29.85 ATP per glucose molecule. 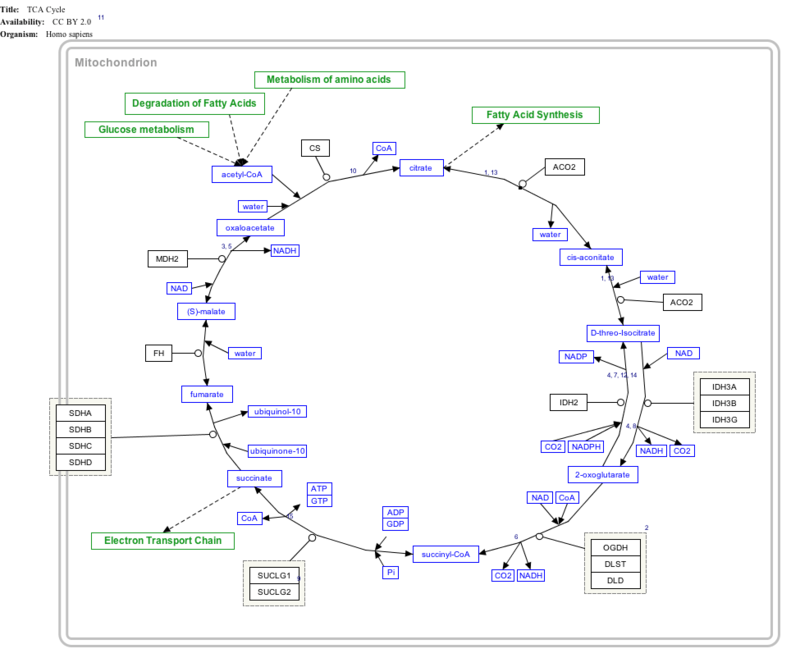 While the TCA cycle is in general highly conserved, there is significant variability in the enzymes found in different taxa (note that the diagrams on this page are specific to the mammalian pathway variant). Some differences exist between eukaryotes and prokaryotes. The conversion of D-threo-isocitrate to 2-oxoglutarate is catalyzed in eukaryotes by the NAD+-dependent EC 1.1.1.41, while prokaryotes employ the NADP+-dependent EC 1.1.1.42. Similarly, the conversion of (S)-malate to oxaloacetate is catalyzed in eukaryotes by the NAD+-dependent EC 1.1.1.37, while most prokaryotes utilize a quinone-dependent enzyme, EC 1.1.5.4. A step with significant variability is the conversion of succinyl-CoA to succinate. Most organisms utilize EC 6.2.1.5, succinate–CoA ligase (ADP-forming) (despite its name, the enzyme operates in the pathway in the direction of ATP formation). In mammals a GTP-forming enzyme, succinate–CoA ligase (GDP-forming) (EC 6.2.1.4) also operates. The level of utilization of each isoform is tissue dependent. In some acetate-producing bacteria, such as Acetobacter aceti, an entirely different enzyme catalyzes this conversion – EC 2.8.3.18, succinyl-CoA:acetate CoA-transferase. This specialized enzyme links the TCA cycle with acetate metabolism in these organisms. Some bacteria, such as Helicobacter pylori, employ yet another enzyme for this conversion – succinyl-CoA:acetoacetate CoA-transferase (EC 2.8.3.5). Some variability also exists at the previous step – the conversion of 2-oxoglutarate to succinyl-CoA. While most organisms utilize the ubiquitous NAD+-dependent 2-oxoglutarate dehydrogenase, some bacteria utilize a ferredoxin-dependent 2-oxoglutarate synthase (EC 1.2.7.3). Other organisms, including obligately autotrophic and methanotrophic bacteria and archaea, bypass succinyl-CoA entirely, and convert 2-oxoglutarate to succinate via succinate semialdehyde, using EC 4.1.1.71, 2-oxoglutarate decarboxylase, and EC 1.2.1.79, succinate-semialdehyde dehydrogenase. The regulation of the TCA cycle is largely determined by product inhibition and substrate availability. If the cycle were permitted to run unchecked, large amounts of metabolic energy could be wasted in overproduction of reduced coenzyme such as NADH and ATP. The major eventual substrate of the cycle is ADP which gets converted to ATP. A reduced amount of ADP causes accumulation of precursor NADH which in turn can inhibit a number of enzymes. NADH, a product of all dehydrogenases in the TCA cycle with the exception of succinate dehydrogenase, inhibits pyruvate dehydrogenase, isocitrate dehydrogenase, α-ketoglutarate dehydrogenase, and also citrate synthase. Acetyl-coA inhibits pyruvate dehydrogenase, while succinyl-CoA inhibits alpha-ketoglutarate dehydrogenase and citrate synthase. When tested in vitro with TCA enzymes, ATP inhibits citrate synthase and α-ketoglutarate dehydrogenase; however, ATP levels do not change more than 10% in vivo between rest and vigorous exercise. There is no known allosteric mechanism that can account for large changes in reaction rate from an allosteric effector whose concentration changes less than 10%. Calcium is used as a regulator. Mitochondrial matrix calcium levels can reach the tens of micromolar levels during cellular activation. It activates pyruvate dehydrogenase phosphatase which in turn activates the pyruvate dehydrogenase complex. Calcium also activates isocitrate dehydrogenase and α-ketoglutarate dehydrogenase. This increases the reaction rate of many of the steps in the cycle, and therefore increases flux throughout the pathway. Citrate is used for feedback inhibition, as it inhibits phosphofructokinase, an enzyme involved in glycolysis that catalyses formation of fructose 1,6-bisphosphate, a precursor of pyruvate. This prevents a constant high rate of flux when there is an accumulation of citrate and a decrease in substrate for the enzyme. Recent work has demonstrated an important link between intermediates of the citric acid cycle and the regulation of hypoxia-inducible factors (HIF). HIF plays a role in the regulation of oxygen homeostasis, and is a transcription factor that targets angiogenesis, vascular remodeling, glucose utilization, iron transport and apoptosis. HIF is synthesized consititutively, and hydroxylation of at least one of two critical proline residues mediates their interaction with the von Hippel Lindau E3 ubiquitin ligase complex, which targets them for rapid degradation. This reaction is catalysed by prolyl 4-hydroxylases. Fumarate and succinate have been identified as potent inhibitors of prolyl hydroxylases, thus leading to the stabilisation of HIF. Several catabolic pathways converge on the TCA cycle. Most of these reactions add intermediates to the TCA cycle, and are therefore known as anaplerotic reactions, from the Greek meaning to "fill up". These increase the amount of acetyl CoA that the cycle is able to carry, increasing the mitochondrion's capability to carry out respiration if this is otherwise a limiting factor. Processes that remove intermediates from the cycle are termed "cataplerotic" reactions. In this section and in the next, the citric acid cycle intermediates are indicated in italics to distinguish them from other substrates and end-products. Pyruvate molecules produced by glycolysis are actively transported across the inner mitochondrial membrane, and into the matrix. Here they can be oxidized and combined with coenzyme A to form CO2, acetyl-CoA, and NADH, as in the normal cycle. However, it is also possible for pyruvate to be carboxylated by pyruvate carboxylase to form oxaloacetate. This latter reaction "fills up" the amount of oxaloacetate in the citric acid cycle, and is therefore an anaplerotic reaction, increasing the cycle’s capacity to metabolize acetyl-CoA when the tissue's energy needs (e.g. in muscle) are suddenly increased by activity. In the citric acid cycle all the intermediates (e.g. citrate, iso-citrate, alpha-ketoglutarate, succinate, fumarate, malate and oxaloacetate) are regenerated during each turn of the cycle. Adding more of any of these intermediates to the mitochondrion therefore means that that additional amount is retained within the cycle, increasing all the other intermediates as one is converted into the other. Hence the addition of any one of them to the cycle has an anaplerotic effect, and its removal has a cataplerotic effect. These anaplerotic and cataplerotic reactions will, during the course of the cycle, increase or decrease the amount of oxaloacetate available to combine with acetyl-CoA to form citric acid. This in turn increases or decreases the rate of ATP production by the mitochondrion, and thus the availability of ATP to the cell. In the liver, the carboxylation of cytosolic pyruvate into intra-mitochondrial oxaloacetate is an early step in the gluconeogenic pathway which converts lactate and de-aminated alanine into glucose, under the influence of high levels of glucagon and/or epinephrine in the blood. Here the addition of oxaloacetate to the mitochondrion does not have a net anaplerotic effect, as another citric acid cycle intermediate (malate) is immediately removed from the mitochondrion to be converted into cytosolic oxaloacetate, which is ultimately converted into glucose, in a process that is almost the reverse of glycolysis. In protein catabolism, proteins are broken down by proteases into their constituent amino acids. Their carbon skeletons (i.e. the de-aminated amino acids) may either enter the citric acid cycle as intermediates (e.g. alpha-ketoglutarate derived from glutamate or glutamine), having an anaplerotic effect on the cycle, or, in the case of leucine, isoleucine, lysine, phenylalanine, tryptophan, and tyrosine, they are converted into acetyl-CoA which can be burned to CO2 and water, or used to form ketone bodies, which too can only be burned in tissues other than the liver where they are formed, or excreted via the urine or breath. These latter amino acids are therefore termed "ketogenic" amino acids, whereas those that enter the citric acid cycle as intermediates can only be cataplerotically removed by entering the gluconeogenic pathway via malate which is transported out of the mitochondrion to be converted into cytosolic oxaloacetate and ultimately into glucose. These are the so-called "glucogenic" amino acids. De-aminated alanine, cysteine, glycine, serine, and threonine are converted to pyruvate and can consequently either enter the citric acid cycle as oxaloacetate (an anaplerotic reaction) or as acetyl-CoA to be disposed of as CO2 and water. In fat catabolism, triglycerides are hydrolyzed to break them into fatty acids and glycerol. In the liver the glycerol can be converted into glucose via dihydroxyacetone phosphate and glyceraldehyde-3-phosphate by way of gluconeogenesis. In many tissues, especially heart and skeletal muscle tissue, fatty acids are broken down through a process known as beta oxidation, which results in the production of mitochondrial acetyl-CoA, which can be used in the citric acid cycle. Beta oxidation of fatty acids with an odd number of methylene bridges produces propionyl-CoA, which is then converted into succinyl-CoA and fed into the citric acid cycle as an anaplerotic intermediate. The total energy gained from the complete breakdown of one (six-carbon) molecule of glucose by glycolysis, the formation of 2 acetyl-CoA molecules, their catabolism in the citric acid cycle, and oxidative phosphorylation equals about 30 ATP molecules, in eukaryotes. The number of ATP molecules derived from the beta oxidation of a 6 carbon segment of a fatty acid chain, and the subsequent oxidation of the resulting 3 molecules of acetyl-CoA is 40. In this subheading, as in the previous one, the TCA intermediates are identified by italics. Several of the citric acid cycle intermediates are used for the synthesis of important compounds, which will have significant cataplerotic effects on the cycle. Acetyl-CoA cannot be transported out of the mitochondrion. To obtain cytosolic acetyl-CoA, citrate is removed from the citric acid cycle and carried across the inner mitochondrial membrane into the cytosol. There it is cleaved by ATP citrate lyase into acetyl-CoA and oxaloacetate. The oxaloacetate is returned to mitochondrion as malate (and then converted back into oxaloacetate to transfer more acetyl-CoA out of the mitochondrion). The cytosolic acetyl-CoA is used for fatty acid synthesis and the production of cholesterol. Cholesterol can, in turn, be used to synthesize the steroid hormones, bile salts, and vitamin D.
The carbon skeletons of many non-essential amino acids are made from citric acid cycle intermediates. To turn them into amino acids the alpha keto-acids formed from the citric acid cycle intermediates have to acquire their amino groups from glutamate in a transamination reaction, in which pyridoxal phosphate is a cofactor. In this reaction the glutamate is converted into alpha-ketoglutarate, which is a citric acid cycle intermediate. The intermediates that can provide the carbon skeletons for amino acid synthesis are oxaloacetate which forms aspartate and asparagine; and alpha-ketoglutarate which forms glutamine, proline, and arginine. Of these amino acids, aspartate and glutamine are used, together with carbon and nitrogen atoms from other sources, to form the purines that are used as the bases in DNA and RNA, as well as in ATP, AMP, GTP, NAD, FAD and CoA. The pyrimidines are partly assembled from aspartate (derived from oxaloacetate). The pyrimidines, thymine, cytosine and uracil, form the complementary bases to the purine bases in DNA and RNA, and are also components of CTP, UMP, UDP and UTP. The majority of the carbon atoms in the porphyrins come from the citric acid cycle intermediate, succinyl-CoA. These molecules are an important component of the hemoproteins, such as hemoglobin, myoglobin and various cytochromes. During gluconeogenesis mitochondrial oxaloacetate is reduced to malate which is then transported out of the mitochondrion, to be oxidized back to oxaloacetate in the cytosol. Cytosolic oxaloacetate is then decarboxylated to phosphoenolpyruvate by phosphoenolpyruvate carboxykinase, which is the rate limiting step in the conversion of nearly all the gluconeogenic precursors (such as the glucogenic amino acids and lactate) into glucose by the liver and kidney. Because the citric acid cycle is involved in both catabolic and anabolic processes, it is known as an amphibole pathway. ↑ Lowenstein JM (1969). Methods in Enzymology, Volume 13: Citric Acid Cycle. Boston: Academic Press. ISBN 0-12-181870-5. ↑ Krebs HA, Weitzman PD (1987). Krebs' citric acid cycle: half a century and still turning. London: Biochemical Society. p. 25. ISBN 0-904498-22-0. ↑ Wagner, Andreas (2014). Arrival of the Fittest (first ed.). New York: Penguin Group. p. 100. ISBN 9781591846468. ↑ Lane, Nick (2009). Life Ascending: The Ten Great Inventions of Evolution. New York: W.W. Norton & Co. ISBN 0-393-06596-0. ↑ "The Nobel Prize in Physiology or Medicine 1937". The Nobel Foundation. Retrieved 2011-10-26. ↑ "The Nobel Prize in Physiology or Medicine 1953". The Nobel Foundation. Retrieved 2011-10-26. ↑ Gest H (1987). "Evolutionary roots of the citric acid cycle in prokaryotes". Biochem. Soc. Symp. 54: 3–16. PMID 3332996. ↑ Meléndez-Hevia E, Waddell TG, Cascante M (September 1996). "The puzzle of the Krebs citric acid cycle: assembling the pieces of chemically feasible reactions, and opportunism in the design of metabolic pathways during evolution". J. Mol. Evol. 43 (3): 293–303. doi:10.1007/BF02338838. PMID 8703096. ↑ Ebenhöh O, Heinrich R (January 2001). "Evolutionary optimization of metabolic pathways. Theoretical reconstruction of the stoichiometry of ATP and NADH producing systems". Bull. Math. Biol. 63 (1): 21–55. doi:10.1006/bulm.2000.0197. PMID 11146883. ↑ Wolfe RR, Jahoor F (February 1990). "Recovery of labeled CO2 during the infusion of C-1- vs C-2-labeled acetate: implications for tracer studies of substrate oxidation". Am. J. Clin. Nutr. 51 (2): 248–52. PMID 2106256. 1 2 3 4 Stryer L, Berg J, Tymoczko JL (2002). Biochemistry. San Francisco: W.H. Freeman. ISBN 0-7167-4684-0. 1 2 Jones RC, Buchanan BB, Gruissem W (2000). Biochemistry & molecular biology of plants (1st ed.). Rockville, Md: American Society of Plant Physiologists. ISBN 0-943088-39-9. ↑ Johnson JD, Mehus JG, Tews K, Milavetz BI, Lambeth DO (October 1998). "Genetic evidence for the expression of ATP- and GTP-specific succinyl-CoA synthetases in multicellular eucaryotes". J. Biol. Chem. 273 (42): 27580–6. doi:10.1074/jbc.273.42.27580. PMID 9765291. ↑ Barnes SJ, Weitzman PD (June 1986). "Organization of citric acid cycle enzymes into a multienzyme cluster". FEBS Lett. 201 (2): 267–70. doi:10.1016/0014-5793(86)80621-4. PMID 3086126. 1 2 Porter RK, Brand MD (September 1995). "Mitochondrial proton conductance and H+/O ratio are independent of electron transport rate in isolated hepatocytes". Biochem. J. 310 (2): 379–82. doi:10.1042/bj3100379. PMC 1135905 . PMID 7654171. ↑ Stryer L, Berg JM, Tymoczko JL (2002). "Section 18.6: The Regulation of Cellular Respiration Is Governed Primarily by the Need for ATP". Biochemistry. San Francisco: W.H. Freeman. ISBN 0-7167-4684-0. ↑ Rich PR (December 2003). "The molecular machinery of Keilin's respiratory chain". Biochem. Soc. Trans. 31 (Pt 6): 1095–105. doi:10.1042/BST0311095. PMID 14641005. ↑ "Citric acid cycle variants at MetaCyc". ↑ Sahara T, Takada Y, Takeuchi Y, Yamaoka N, Fukunaga N (March 2002). "Cloning, sequencing, and expression of a gene encoding the monomeric isocitrate dehydrogenase of the nitrogen-fixing bacterium, Azotobacter vinelandii". Biosci. Biotechnol. Biochem. 66 (3): 489–500. doi:10.1271/bbb.66.489. PMID 12005040. ↑ van der Rest ME, Frank C, Molenaar D (December 2000). "Functions of the membrane-associated and cytoplasmic malate dehydrogenases in the citric acid cycle of Escherichia coli". J. Bacteriol. 182 (24): 6892–9. doi:10.1128/jb.182.24.6892-6899.2000. PMC 94812 . PMID 11092847. ↑ Lambeth DO, Tews KN, Adkins S, Frohlich D, Milavetz BI (August 2004). "Expression of two succinyl-CoA synthetases with different nucleotide specificities in mammalian tissues". J. Biol. Chem. 279 (35): 36621–4. doi:10.1074/jbc.M406884200. PMID 15234968. ↑ Mullins EA, Francois JA, Kappock TJ (July 2008). "A specialized citric acid cycle requiring succinyl-coenzyme A (CoA):acetate CoA-transferase (AarC) confers acetic acid resistance on the acidophile Acetobacter aceti". J. Bacteriol. 190 (14): 4933–40. doi:10.1128/JB.00405-08. PMC 2447011 . PMID 18502856. ↑ Corthésy-Theulaz IE, Bergonzelli GE, Henry H, et al. (October 1997). "Cloning and characterization of Helicobacter pylori succinyl CoA:acetoacetate CoA-transferase, a novel prokaryotic member of the CoA-transferase family". J. Biol. Chem. 272 (41): 25659–67. doi:10.1074/jbc.272.41.25659. PMID 9325289. ↑ Baughn AD, Garforth SJ, Vilchèze C, Jacobs WR (November 2009). "An anaerobic-type alpha-ketoglutarate ferredoxin oxidoreductase completes the oxidative tricarboxylic acid cycle of Mycobacterium tuberculosis". PLoS Pathog. 5 (11): e1000662. doi:10.1371/journal.ppat.1000662. PMC 2773412 . PMID 19936047. ↑ Zhang S, Bryant DA (December 2011). "The tricarboxylic acid cycle in cyanobacteria". Science. 334 (6062): 1551–3. doi:10.1126/science.1210858. PMID 22174252. ↑ Voet D, Voet JG (2004). Biochemistry (3rd ed.). New York: John Wiley & Sons, Inc. p. 615. ↑ Denton RM, Randle PJ, Bridges BJ, Cooper RH, Kerbey AL, Pask HT, Severson DL, Stansbie D, Whitehouse S (October 1975). "Regulation of mammalian pyruvate dehydrogenase". Mol. Cell. Biochem. 9 (1): 27–53. doi:10.1007/BF01731731. PMID 171557. ↑ Koivunen P, Hirsilä M, Remes AM, Hassinen IE, Kivirikko KI, Myllyharju J (February 2007). "Inhibition of hypoxia-inducible factor (HIF) hydroxylases by citric acid cycle intermediates: possible links between cell metabolism and stabilization of HIF". J. Biol. Chem. 282 (7): 4524–32. doi:10.1074/jbc.M610415200. PMID 17182618. 1 2 3 4 5 Voet, Donald; Judith G. Voet; Charlotte W. Pratt (2006). Fundamentals of Biochemistry, 2nd Edition. John Wiley and Sons, Inc. pp. 547, 556. ISBN 0-471-21495-7. 1 2 3 4 5 6 7 8 9 10 11 12 13 14 15 Stryer, Lubert (1995). "Citric acid cycle.". In: Biochemistry. (Fourth ed.). New York: W.H. Freeman and Company. pp. 509–527, 569–579, 614–616, 638–641, 732–735, 739–748, 770–773. ISBN 0 7167 2009 4. ↑ Halarnkar PP, Blomquist GJ (1989). "Comparative aspects of propionate metabolism". Comp. Biochem. Physiol., B. 92 (2): 227–31. doi:10.1016/0305-0491(89)90270-8. PMID 2647392.